For a graphic representation of the difference between private property ownership and government ownership, it's hard to do much better than this photograph I took yesterday, which you might call "where the sidewalk ends." A privately cleared sidewalk ends abruptly in a drift of snow left uncleared by the government. To explain what you are seeing, the foreground is a stretch of sidewalk near a private business. The business has shoveled it and salted it so that customers can reach the store and so that the business can make a profit, and so that customers who slip on the ice or snow don't sue, and so that the city doesn't give the business a ticket for failing to clear the sidewalk. In the middle of the path, the clearing suddenly stops and becomes a pile of uncleared, and pretty much impassible to pedestrians, snow and ice. That's the point at which the path stops being a sidewalk near a supermarket parking lot, and starts being a sidewalk near a parking lot for a commuter railroad station owned and operated by the Massachusetts Bay Transportation Authority, which is part of the state of Massachusetts' Department of Transportation. The MBTA, unlike the private business, doesn't care if the path is shoveled, because if customers can't make it to the station, or if they slip and fall, the deficits will be covered by taxpayers. And the government doesn't usually fine itself for failing to plow. This is true even if the state agency is overseen by a Republican governor who presents himself as a competent manager with private sector experience, and even if the commuter rail service is contracted out to a private bidder. It's just the difference between state ownership and private ownership. I will add in fairness that the sidewalk of the post office across the street, not visible in the photo, is totally clear. 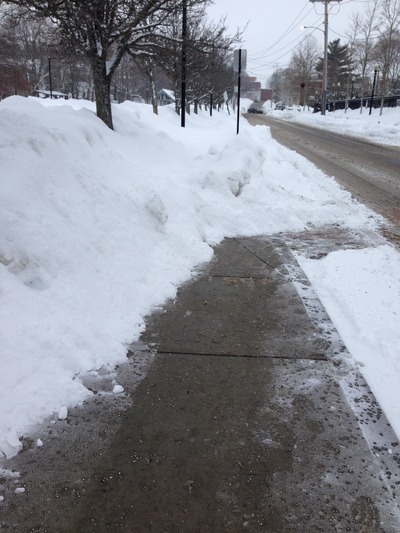 It may be that the post office is renting from a commercial landlord, or it may be that given the business it is in, the postal service is more attuned to the need for clear sidewalks than most other government agencies are.